I did this tag last year and had a lot of fun with it, so I thought it would be fun to bring it back around for 2018! Last year, I assumed this meant a book I planned on reading to transition into winter, so I’m gonna go with that for this year, too. 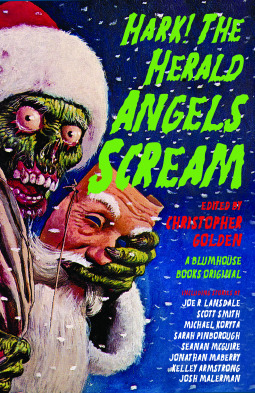 I’m actually reading one right now that is a Christmas horror anthology, and it’s getting me in the spirit pretty well! There are actually only two 2018 releases left on my radar, and I have ARCs of both of them: Kingdom of Needle and Bone by Mira Grant, and The Sorrows by Jonathan Janz! Oooh, this is such a good question. Okay, I’m gonna go with three of my most anticipated January ARCs: In An Absent Dream by Seanan McGuire, The Gilded Wolves by Roshani Chokshi, and Song of the Dead by Sarah Glenn Marsh. I honestly think it’s entirely plausible that any of the five above mentioned books could be my fave of the year, but I don’t really expect anything to unseat my current fave of the year—which I won’t tell you, because I have a favorites list coming soon! Ohh ithink I should give this a try this year too.. i dont think i’ve done it ´ast year? 🤔 I really have no idea.. ahah ooops! Even if you did do it last year, you could totally do it again! Any time! ❤ I can't wait to read your answers! Haha we should totally finish Ash Princess in January for the Late-a-thon if you're interested! Yay! 😀 I’m adding it to my list for January so I remember to mention it again to you closer to time lol! I can’t wait to read it! I love her writing so much! Great tag! I have tours and releases booked for March already. January is pretty full too and February is getting there. Thank you! Oooh, busy schedule for sure! I feel you. 🙂 Good luck with yours! oooh i’m excited for your favorites list. hope you have an excellent end of the reading year!! Bahahaha :’) Only a few additions, though, that’s not too bad! You should definitely go easy on yourself with your goals! ❤ I'm still narrowing mine down, I've had a word document that I've been throwing ideas on as they come to me for the last few weeks so I'll probably try to finalize it all in the next couple of weeks and make the post maybe mid-December. Great answers and thanks for the tag, sweets! I was just granted an arc for Kingdom of Needle and Bone and am so excited! BUDDY READ?!?!?!?! Any time, love, and thank you! ❤ Ooooh, I'm totally down for it! I was planning on reading it one day this week, actually – would you be interested in starting it after we finish The Gilded Wolves?